Menchie’s is nothing new to me. This serve-yourself frozen yogurt bar has been a family favorite dessert destination spot for years now. The great thing about Menchie’s is that each and every trip here can be a new experience. There is always a wide variety of frozen yogurt flavors to choose from, as well as sorbets. Menchie’s also often introduces new flavors to try to keep things exciting. We go to Menchie’s to celebrate. We go to Menchie’s to drown our sorrows on a bad day. I always joke around about Menchie’s being the best medicine and a remedy to take your day to better heights. When I’m stuffing my face with froyo I don’t have a care in the world. This Menchie’s review will inform you of everything you need to know about this unique frozen yogurt shop! 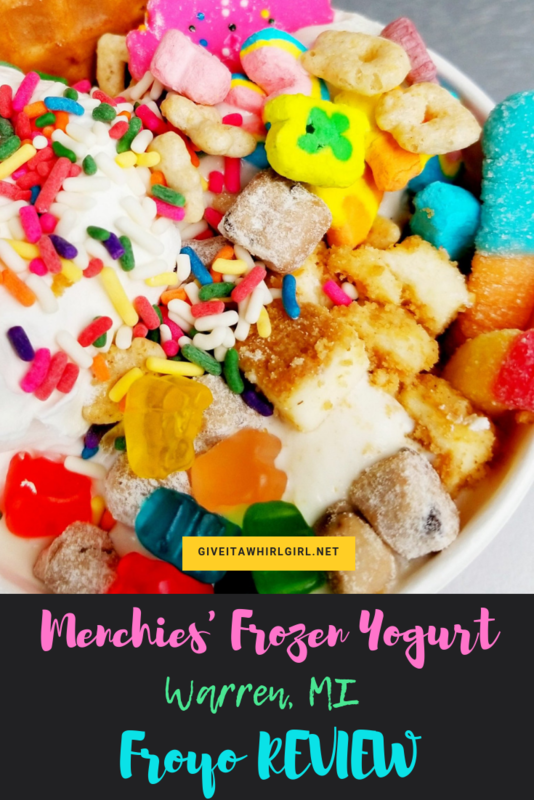 My Menchie’s Review & everything you need to know! Upon walking in you see a serve yourself frozen yogurt and topping area. How neat! I have always had a spot in my heart for frozen yogurt. I used to get so excited when my mom took us to TCBY and we could choose 3 different toppings for a parfait. You, however, did not have the opportunity to serve yourself there, somebody else took care of you. Menchie’s has a help yourself frozen yogurt bar and a serve yourself topping bar where all your wildest dessert dreams can become a reality. You can build and create anything your heart desires. I love this help-yourself approach to frozen yogurt. It is a gratifying experience to walk into a place like this and create your own little (or big) cup of edible art. At Menchie’s your creation is completely and totally up to you! The froyo is in your hands. Your froyo creation is sold by weight. So if you go wild and crazy with the froyo and the toppings be prepared to pay a hefty amount for that epic creation of yours. You can scope out all of the flavors that Menchie’s has available by clicking THIS LINK. Please note that not all flavors will be available at your location. Call your local store up if you want to inquire about what flavors they have available. My local Menchie’s has seven self-serve froyo stations and each station has two flavors. You can help yourself or swirl both flavors together. This means that there are usually 14 different flavors available. One of my usual go-tos is the Takes The Cake Batter. The Rich ‘n” Nutty Pistachio is another favorite. The pistachio always gives me flashbacks of the pistachio pudding that my grandma used to make with me and my sister. Menchie’s toppings… the fun part! My favorite part of visiting Menchie’s is dressing up my froyo with all of the available toppings. Decisions! Decisions! Only so much can fit into the cup so you have to be a little choosy with what you go with. Menchie’s has the available toppings menu online. Please note with this as well,Â not all toppings will be available at every Menchie’s location. I didn’t see the Bursting Boba toppings available yesterday and those are one of Chloe’s favorites. She usually builds a fruity sorbet cup and goes with colorful toppings such as boba and gummy candies. Do not go too crazy with different flavors and toppings. Think things through and really think to yourself, “is this going to taste good?” If your Menchie’s does not taste good, you are probably to blame. They charge by weight so if you want to keep it on the cheap side do not out an enormous amount of froyo in your cup. Also, stick to light toppings like candy sprinkles, whipped cream, etc. They have a lot of gummy candy toppings to choose from but keep in mind that your froyo is FROZEN yogurt so once that gummy candy sits there on top of your creation for a bit it does tend to get on the hard side, as opposed to soft like a gummy candy should be. I forgot to get a photo of the liquid toppings available like marshmallow and hot fudge. It is a good idea to put this on your froyo BEFORE the toppings. Menchie’s does offer a rewards program, known as My Smileage, so you can save on frozen yogurt once you reach a certain amount of money spent. Once you reach 50 Smiles (spend $50) you get a $5 reward. Just for signing up they start your account with 25 Smiles. Don’t forget Menchie’s for your next celebration. They do offer frozen yogurt cakes! Orange Leaf is a froyo competitor and they offer little paper dividers for your cup so different flavors and prevented from blending together. Offer breakfast flavors as a regular option. Last year Orange Leaf offered a line of breakfast flavored froyo like pancakes w/ syrup, Fruity Pebbles, etc. The breakfast flavors are my favorite. Keeping these flavors as a permanent offering would be fabulous. I would even visit in the morning for a breakfast treat if those flavors were always available. Rearrange the stations just a bit. The liquid topping area is at the end of the self-serve area. I think it just makes sense to put hot fudge, etc. on top of your froyo BEFORE you put the cute little toppings on. When you put this on last it smothers your creation. I hope my Menchie’s review has opened your eyes about this unique place to visit. The possibilities really truly are endless! You can get creative at Menchie’s with the HUGE toppings bar that they have. There is a wide variety of toppings and sauces for your frozen yogurt creation. It is also a very family-friendly place. Your children will love Menchies… I guarantee it! Want to learn more about Menchie’s? Find them online at their website. Use the handy store locator tool. Have you ever been to Menchie’s? What does your favorite cup of froyo look like? Leave me a comment and let me know, don’t be shy! If you have never visited this place will this Menchie’s review inspire you to go? I sure hope so and I hope you love your first experience there. I was hooked from my first visit! This entry was posted in Local Spots I Visited and tagged candy, candy sprinkles, froyo, frozen yogurt, Menchie's, michigan, restaurant, restaurant review, review, self-serve, sundae, Warren. Bookmark the permalink. Thank you! When I go to Menchie’s I like to think of my froyo cup as edible art lol. Yum! This looks so good. I’ve heard of Menchie’s but never been to one. I love frozen yogurt though, and it looks like you have tons of great topping options.